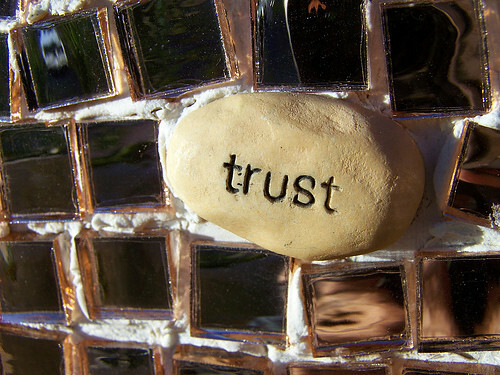 My article this time is about how to build a trust. The foundation of each relationship, whether it's business, partner, parent, client, or friend, is trust. Trust is not something that can be built with the blink of an eye, but through a habit that is consistent in your interaction relationship. Don't try to hide something from other people. Keep away from all kinds of hidden agendas/plans. You might think you can trick them. But you need to know, most people have good intuition, and even though they don't know exactly what your hidden plan is, they at least have an unpleasant feeling near you. Usually, people who have hidden plans will be seen from their body language. (See also How to Know Someone is Lying). If they feel uncomfortable being near you, they also will not be able to put trust in you. This is similar to point number one. Say something honestly. Don't try to trick others with your words, such as giving false praise or pretending to give support. Again, people have a kind of detector. When someone knows that you are truly sincere, their trust will increase for you. People like the truth. In each relationship, focus on actions that touch someone's heart. Work hard for that, because when you succeed in adding value to someone's life, they not only feel that you are on their side, they will also have the urge to do the same to you. For example, in a business relationship, you do something faster than promised. In a personal relationship, you focus on fulfilling your partner's desires rather than your own desires. Wherever you talk to someone, make it the main focus. Don't think about working in the office when you are at home and talking to your partner. Instead, don't think about the conditions at home when you are with a client. Coming up with all your body and soul means that you give quality time and quality time will build trust. Since childhood, we have always been taught by our parents and teachers to respect others. However, because of environmental influences, these values ​​begin to wear off, we are instead carried over to bad habits of underestimating others. This includes the behavior of talking about things that are not good behind someone. Remember, the dignity of others as humans, they have the right to be treated with respect. When people know that you always treat them with respect, then people will put a lot of trust in you. When you are in a mess, immediately take care of yourself without exception. Other people will not understand and may not care about the problems you are experiencing. Forget looking for excuses, and just take the responsibility given to you, don't need to think much. Justification and making excuses may help you in the short term, but for the long-term, it will reduce the level of trust people have towards you. Today, being brave is a character that is hard to find where most people often avoid the negative consequences of their actions. Dare to make a difference so you will win the trust of others. Unless you are a mind reader, the only way you can find out how well your relationship with someone is by asking for feedback (feedback) from that person. Don't just passively wait for someone to give you feedback, but you must actively ask for it. Most people are afraid to give feedback to you, especially if it contains negative things. Sincerely ask someone and give a good response, then the person will be willing to give feedback to you. Accept all feedback, both positive and negative, and as much as possible change your bad habits based on that feedback. Learn to overcome criticism with gratitude. Compared to you staying (defensive), consider what other people say, maybe there is a point. Closing yourself from all criticisms has the effect of closing all communication. In some cases, criticism may be incorrect. For this example, you have the opportunity to show empathy. Try to understand someone's problem from his perspective. Maybe criticism is just an emotional overflow of resentment that they have at you. Your willingness not to take a defensive attitude will increase your sense of trust in your relationship and that person. Good language must be able to hold fast. Just say good words to people, even if the person doesn't say good to you. Hurry up and apologize when you find out that you are wrong. Why do you have to do this? First, imagine what you feel if people get good experiences with you. Second, imagine the behavior of people who will be brought along better because they are close to you. People will put great trust in you. A promise is something that has a very strong impact. Justify all the promises you have made. Make your words much stronger than any written contract, and never make an empty appointment. As a result, people will respect you and put high trust in you. No less important, be consistent with the above behaviors. Don't just do it occasionally. Consistency is the key to keeping other people's trust in you. What Are The Things That Cannot Be Bought With Money? How to Find Happiness in Just 5 Minutes?